Celebrating the 12 Academy Students of The Year. The 12 Academy Students of the Year will be recognized at the MNPS Board of Public Education meeting. 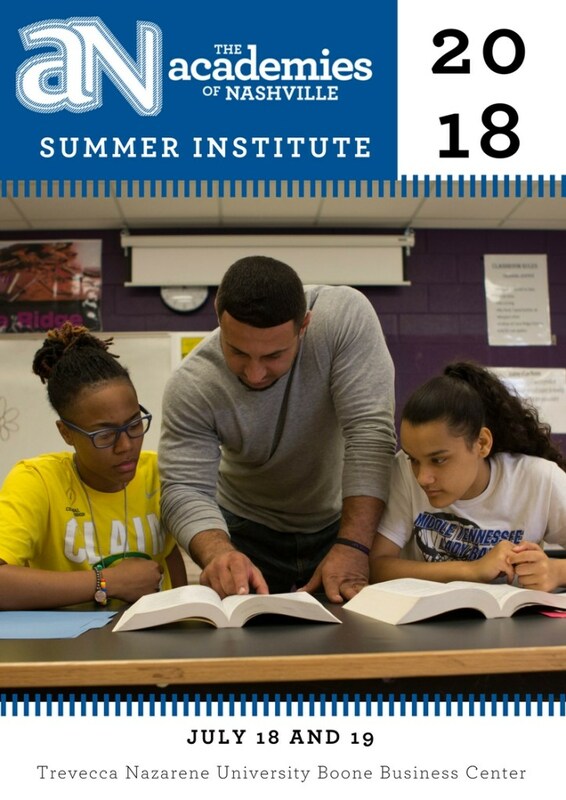 The Academies of Nashville Institute is where teachers and staff who support the academies at their high school receive strategies for instruction, teacher teams, and engaging business partners. The Nashville Hub hosts the Academies of Nashville Study Visits, to share how Nashville has transformed its high schools into personalized learning communities that offer rigor, relevance, relationships, and readiness for all students. The Career Exploration Fair will provide an avenue for high school freshmen in Nashville schools to explore a breadth of career areas. As opposed to a Job Fair where students visit companies, the career fair will allow companies to work together to represent career areas for students to explore. The majority of dropouts occur between the freshman and sophomore year. Our goal is to raise awareness and excitement that will allow freshmen to talk with local professionals about their interests and see the relevance of their studies. The fair will host approximately 7,000 freshmen from the Academies of Nashville and the Magnets of Nashville on Friday, October 7 at the Music City Center. Students will complete career exploration research at school in preparation for their visit and learn about “professionalism.” They will also participate in an essay contest and other follow-up activities to show what they learned. They will speak with at least three booth volunteers, ask questions, and participate in hands-on activities. On the day of the event, exhibitors will be set up and participate in an exhibitors’ meeting at 7:00 AM. Students will begin to arrive at the fair by 7:30. Approximately 600-700 students are tentatively scheduled at any given point of the day between 7:30 and 2:00 PM. To accommodate all of our students, we will need to showcase approximately 250 careers. Each of the five Partnership Councils will organize a section of the fair (approximately 5,000 square feet) to represent their respective industry areas. Students represent a wide range of proficiencies, so careers should reflect a broad spectrum of post-secondary requirements. Students need to learn about the difference between entry and upper level positions as well as career paths to which they can aspire. National trends are causing changes to careers in each industry area. Some careers will provide better opportunities than others for future employment. Students are drawn to hands-on activities; therefore, each booth should have an interactive component to engage student interest. Volunteers will be able to load-in and tear-down during the designated times before and after the event. They will also be responsible for ensuring that their exhibits have an adequate number of volunteers at any given time and will be allowed to rotate in shifts throughout the day as is convenient for them. On behalf of MNPS and the Nashville Area Chamber of Commerce, the generosity of our business partners in donating their time, space, and equipment is greatly appreciated and will ultimately ensure the success and lasting impact of the Career Exploration Fair. How to Move the Academy Team from Good to Great? Students in Metropolitan Nashville Public Schools (MNPS) regularly engage in Project Based Learning (PBL), in all classes where students go through an extended process of inquiry in response to a complex question, problem, or challenge. These rigorous projects help students learn key academic content and practice 21st Century Skills such as collaboration, communication and critical thinking. To recognize the efforts of our teachers and students, MNPS will host a high school Student Project Exposition open to all high school students in the district. Projects invited to present at the expo will be selected from the best abstracts submitted for consideration. The Student Project Expo will be held on Thursday, March 14, 2013, at the Trevecca- Nazarene University Boone Convocation Center. During this event, students in grades 9-12 will showcase their collaboration, communication, and critical thinking skills by displaying projects created throughout the year in preparation for college and careers. For additional questions or information regarding the MNPS Project Expo please email mnpsprojectexpo@gmail.com. When you using this email address, please keep in mind that you will not receive a direct response, but a Frequently Asked Questions section will be developed on this website as questions arise. Please check back frequently for more information and details. Projects can be the work of an individual student or a team of students (two – four students working on a project constitute a team). Projects completed by teams of more than four students are ineligible. Students may only enter one project. The completed projects must demonstrate that student(s) went through an extended process of inquiry in response to a complex question, problem, or challenge following the Buck Institute of Education PBL model. Business partners will have the opportunity to sponsor the MNPS Project Expo. As a sponsoring partner, businesses will have the opportunity to create special awards and will identify recipients based on their own criteria. A common rubric will not be used for special awards. To become a sponsor, complete the sponsorship form and submit it by February 15, 2013. Interested students are required to submit an abstract of their project for consideration online. Abstracts will require students to explain their project in terms of the Project Based Learning model. Each abstract will be reviewed and scored by an expert panel. Abstract scores will determine which projects are invited to participate in the Project Expo. The top 10 scoring projects for each category will receive an automatic invitation to participate. Beyond the top 10, all high schools will be invited to showcase their top projects in each category. The online application process will open on Monday, January 7, 2013. Applications are due by 12:00 (noon) on Friday, February 1, 2013. Students and faculty advisors will be notified of invitation to participate in the MNPS Project Expo by Friday, February 22, 2013.